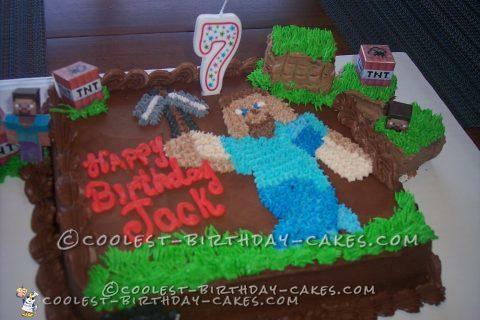 My grandson requested a “Minecraft” cake for his 7th birthday. When I told him I didn’t know what that was or if I could do it, he said all you have to do is make some square and put grass on them!! Did a little research, looking for ideas. Cake was chocolate with chocolate icing, and buttercream for the colored parts. I found some Minecraft cut-outs that I printed out, made into the shapes and placed those around the cake, along with the “squares with grass on them”. He was impressed as I could tell from the smile on his face.